Releasing the same day as Secret Empire 10, Deadpool 35 is the first book that shows us a glimpse of the Marvel U the post-Secret Empire. 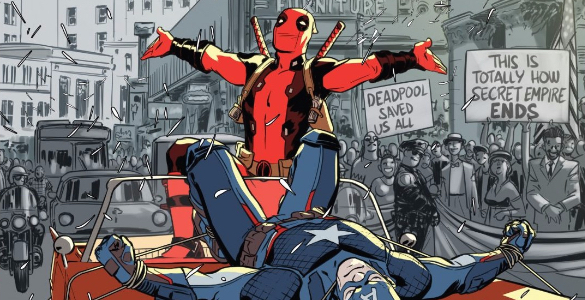 It’s also the issue where Deadpool admits something that we’ve known since Steve Rogers ordered him to kill Coulson: Wade is heading for a fall. The book opens with “Supreme Leader Steve Rogers” giving kids at Ellie’s school a lesson on protecting your neck and not bullying Ellie. 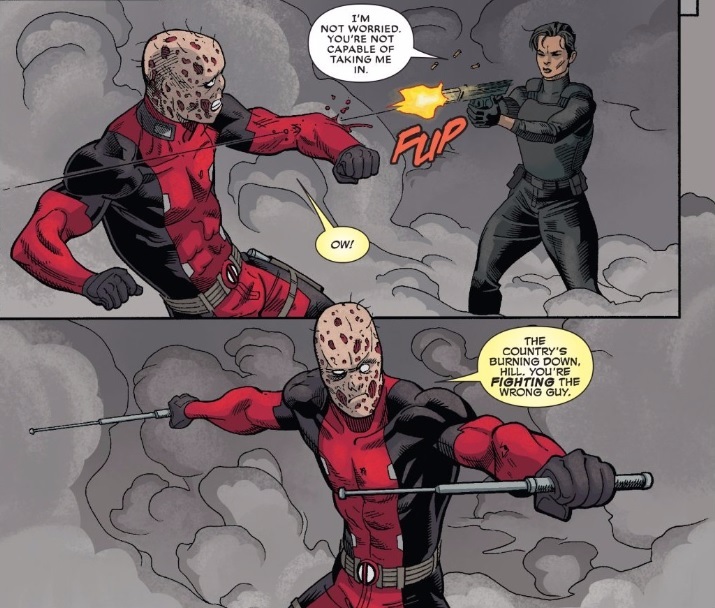 Shortly after, Maria Hill arrives and shoots “Steve” in the head, revealing him to be Deadpool in disguise. In a way, Maria Hill is the perfect foil for Secret Empire Deadpool: he was one of the first people to buy into Steve’s Hydra BS and Hill was the first to see Steve for what he really was. Wade wants to reason with Hill and see things from his POV, but Hill is single-minded in her bloodlust. To equate Deadpool’s allegiance to Rogers to a voter’s allegiance to Trump would be a disservice to Wade Wilson. 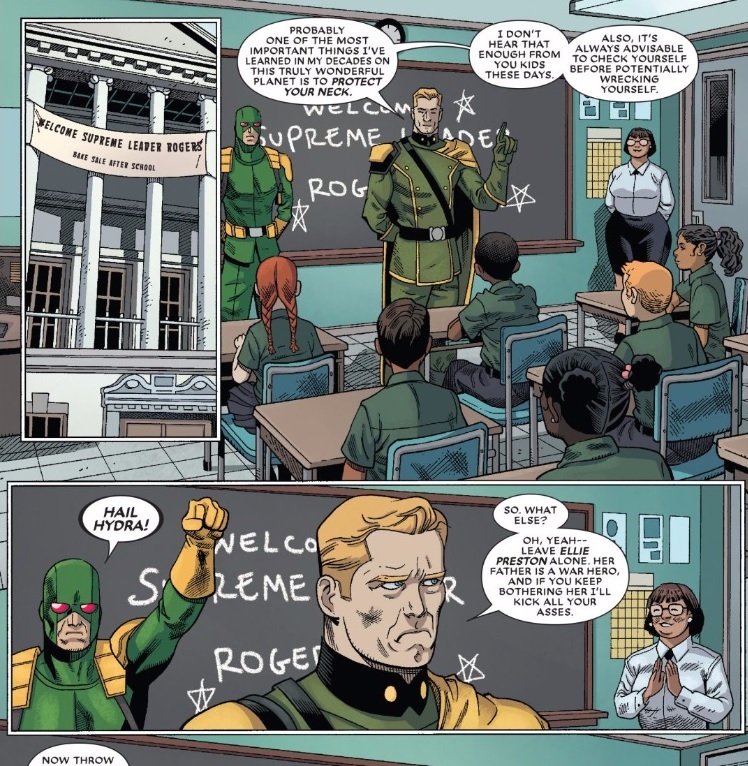 For Wade, there is a lot of hero worship and rewarded faith involved in his loyalty to the fictional dictator. But as he fights Hill he tries to justify his actions by saying how “the country is burning.” I don’t believe that many Americans who voted for Trump were lifelong Trump fans, but like Wade they saw “a nation in turmoil” and decided that there was only one crazy, obviously evil man for the job. “doppelganger” is in SHIELD custody — I wonder if he will have a villainous return someday or fall into obscurity altogether. In the end, Gerry Duggan and Mike Hawthorne once again proves that Deadpool can be a tragic character as well as a comedic character. 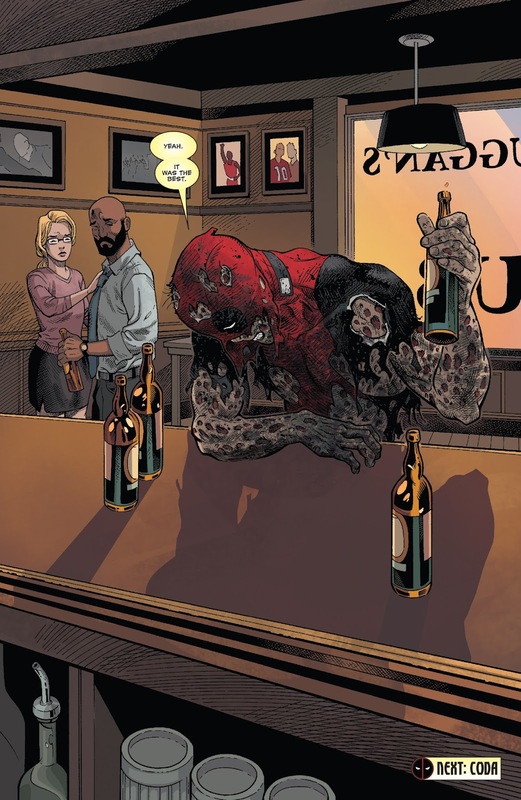 Broken, defeated and literally falling apart, Wade drowns his sorrows in a handful of mournful beers.